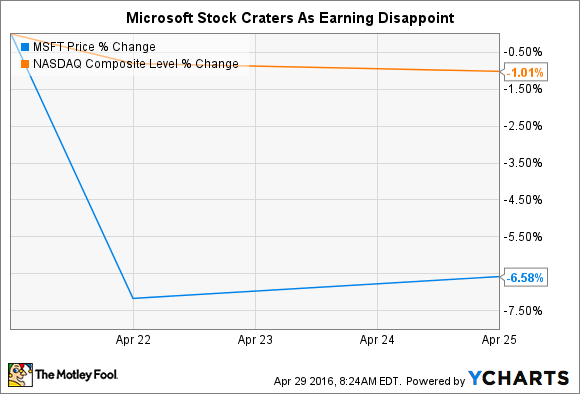 Are Microsoft's Weakening Cloud Margins a Cause for Concern? Amid a disappointing overall quarterly performance, we drill down into the slowing growth and declining profits in Microsoft's important cloud business. After beating expectations in its first two FY 2016 earnings reports, Microsoft's (NASDAQ:MSFT) multi-year turnaround seemed like it might finally have taken root. Unfortunately, its earnings miss last week came as a sharp rebuke to that idea, a fact not missed by investors. To chart its path into the post-PC world, Microsoft has placed aggressive bets in growth markets, including big data and productivity tools. At the same time, many view Microsoft's cloud-computing business as, perhaps, the company's biggest opportunity, which is why investors should take note of the relatively weak performance of its cloud business this past quarter. Though far from cataclysmic, Microsoft's cloud business showed several signs of weakness in Q3, especially when considered in total. For starters, though growing faster than other reporting segments, Microsoft's intelligent cloud business produced its slowest growth thus far in its fiscal 2016. Microsoft is currently battling large-cap tech rivals including market-leader Amazon.com (NASDAQ:AMZN), Alphabet, and IBM for cloud market share, so slowing growth isn't an encouraging sign. For comparison's sake, Amazon's AWS segment grew sales at nearly 70% in its FY 2015 fourth-quarter report. Even after backing out the effect of foreign-exchange headwinds, Microsoft's 8% cloud growth pales in comparison. That isn't the only cause for concern. Microsoft's operating margins in its intelligent cloud division continued their general downward trend, with a particularly acute decline this quarter. Though still profitable, the segment's 16% decrease in profitability in just one year deserves further investigation. In digging deeper, a few possible explanations emerge. First, let's examine an accounting-based explanation for intelligent cloud's dwindling profitability. In order to expand its service capacity, Microsoft has been aggressively investing in data centers and servers that serve as the infrastructure backbone for its cloud services. At a somewhat simplified level, the costs of such investments are spread out over the fixed assets' estimated useful life through annual depreciation expenses. As such, it's entirely possible, depending on how Microsoft allocates its CapEx and depreciation, that the above margin compression could reflect some of these infrastructure costs making their way into the cloud division's P&L. If that's the case, then this margin deterioration isn't necessarily indicative of the segment's long-term profit potential, which should afford shareholders some degree of comfort. Microsoft doesn't provide information about its servers' and data centers' useful lives, so it's hard to have a firm sense of to what degree this influenced the cloud margin decline. It's worth noting that CFO Amy Hood indeed cited an increased in cloud-specific CapEx as one of the three factors contributing to cloud margin contraction on the company's conference call; the other two were greater adoption of Microsoft's Azure cloud service and foreign exchange headwinds. However, without more specific data, it's hard to gauge the relative importance of these factors. Though obviously not a factor a CFO would mention, I find myself wondering whether price competition is having a deleterious effect on the gross margins for Microsoft's cloud segment. It's generally agreed that the cloud market will ultimately prove large enough to support a number of large-scale service providers. However, as the battle for market share continues unabated, intense price competition has been a defining theme across the market. In the decade since it launched, Amazon alone has lowered the prices for various AWS services 51 times. The cloud computing business model offers providers like Amazon, Microsoft, and Alphabet amazing economies of scale, so it isn't clear, as well, to what degree price competition might have eroded its segment's gross margins, which naturally bleed into operating margins, as well, for Microsoft. We know that, as a more general proposition, this tends to be true in business, in general -- but that's far from conclusive in this specific instance. At the end of the day, it's hard to put a finger specifically on the driver behind Microsoft's relatively weak cloud-division performance. In light of the long-term nature of the market and Microsoft's still-compelling margins, investors needn't panic at this stage in the game, though they should monitor this trend during the next several quarters.